Occasionally beta testers who take the time to dig through the updates they’re testing manage to uncover gold, and that seems to have happened for some PC gaming Steam users. Posting to Github, SteamDB has revealed that it has uncovered assets in a recent beta update that point towards a fairly dramatic UI overhaul sometime in the future. The filenames for the images in the update refer to something called ‘SteamU’ which many users are speculating means Steam Universal. 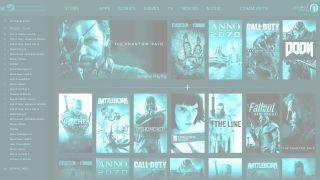 The images show a new look for Steam, with new navigation and search bars as well as a row of tabs across the top of the screen which clearly separate users’ collections of games, comics, apps, TV shows, movies, and music. The image above shows what appears to be the games tab where the user’s installed games appear as clickable tiles. There’s another row of games along the top of the page which are separate from the rest, the most likely explanation for which is that they’re the user’s most recently played titles. There’s also another image which seems to depict some kind of hub. We imagine that once you select a title you’d be directed to its hub page where it appears you’ll be able to access information about the game as well as details of your own progress and achievements within it. These images are, of course, mock-ups so we’d say don’t get too excited – these images could very well be extremely early and changeable concepts and any kind of UI change could be months or even years away. That said, considering its age and the amount of non-game content that’s now on Steam an interface redesign feels overdue. Perhaps tellingly, shortly after these assets were uncovered, Valve issued another beta update which removed the images. They are, however, still archived on GitHub for anyone looking to access them.